Do you look at yourself and feel beautiful, or do you see all the things the world calls imperfect and unattractive? 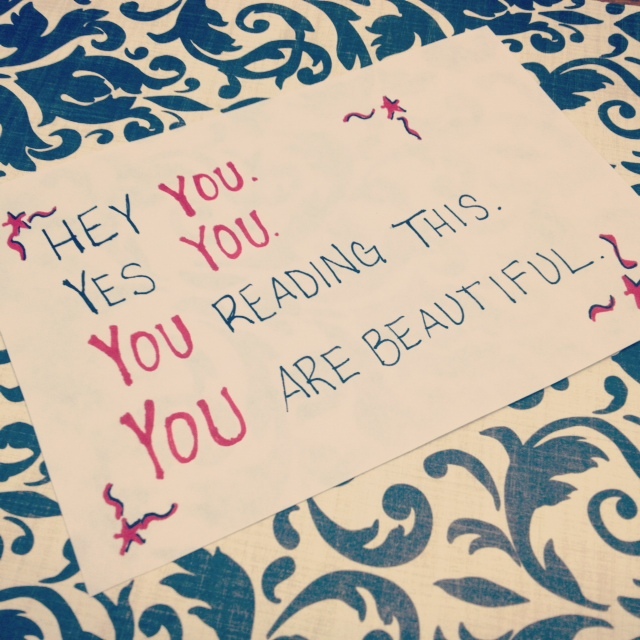 Go to your mirror today and write down everything you see that is beautiful. I remember when I was dealing with some major self-image issues, I was given a similar assignment, and I couldn’t do it. I didn’t like what I saw in the mirror, so I never finished the study simply because I refused to do that one assignment. I’ve since learned that when a person is filled with God’s Holy Spirit, she radiates his light. People see beauty when they see her, but it’s an unexplainable type of beauty—something many people haven’t seen before, and they find themselves drawn to her just to get a glimpse of that kind of beauty. Sweet friend, you are beautiful, and if you have Christ in your life and close to your heart, you radiate that same beauty. You don’t have to dress provocatively, and you don’t have to spend hours getting your makeup perfect to be beautiful because it’s already there. You’re already beautiful. Why else might it be difficult to write down all the things you think are beautiful about yourself? More than likely you don’t want to sound conceited. A girl who thinks she’s better than other girls is not at all attractive to anyone, but you know what is? A girl who is confident in the beautiful creature God created her to be is attractive to everyone. Keep in mind I’m not talking about attraction the way the world uses this word. I’m talking about an attraction like a magnet is attracted to metal. Just like I mentioned above, a confidence in who you are and who you were created to be radiates a light and beauty that is unexplainable to any of us. It’s a beauty like no other. There is a huge difference between being conceited and being confident in who you are. Can you imagine how painful it might be for God to hear you question that beauty he so carefully designed and molded together? Who are you to argue with your creator who is completely enthralled by your beauty (Psalm 45:11)? God is the creator of everything good and beautiful. No one knows beauty like he does, and he says you are a perfectly created young lady who is not only beautiful but absolutely stunning. You are so beautiful he wants nothing more than to spend time with you. It’s not by your actions but by who you are that he delights in you and wants to give you any and all desires of your heart (Psalm 37:4). This week, allow God to be delighted in you and spend quality time growing in your relationship. You’ll find a love you’ve never known through this quality time. Your beauty will grow brighter as your spirit grows stronger. I hope you can go back to the mirror and fill your paper with all the beauty you see when you look at the reflection. Will you try it? I love having the chance to give this message when I’m invited to speak at various events. I have been given such a passion to help girls of all ages realize how much they’re worth. Confidence is one of the strongest qualities a person can hold. No wonder it’s where the enemy hits women the hardest.